The luxury polished chrome traditional triple exposed valve With spout from the Downton Abbey Brassware Collection features a beautifully crafted handset, finished in chrome with a white ceramic handle and a chrome shower hose and fixed head. Comes with a built-in diverters. The classically styled thermostatic shower valve has been made from solid brass with a chrome finish and incorporates a built-in anti-scald device for complete peace of mind when showering. Easy to operate - the top lever control operates the overhead shower or handset, the central cross head control adjusts the temperature and the bottom lever control operates the bath spout. 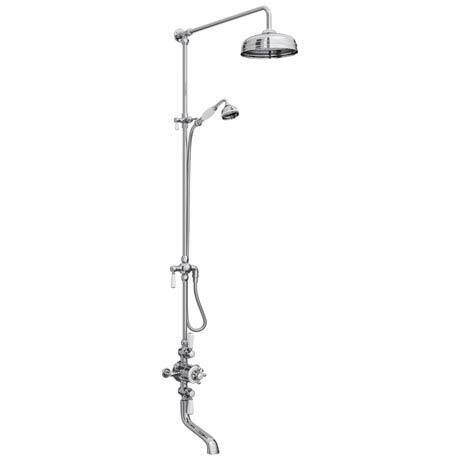 Diameter of fixed shower head is 8"
Riser kit includes sliding rail, shower hose and fixed shower head.